This one has a neat iridescent sheen to its wings. See the discussion for details on this fly's tentative ID. 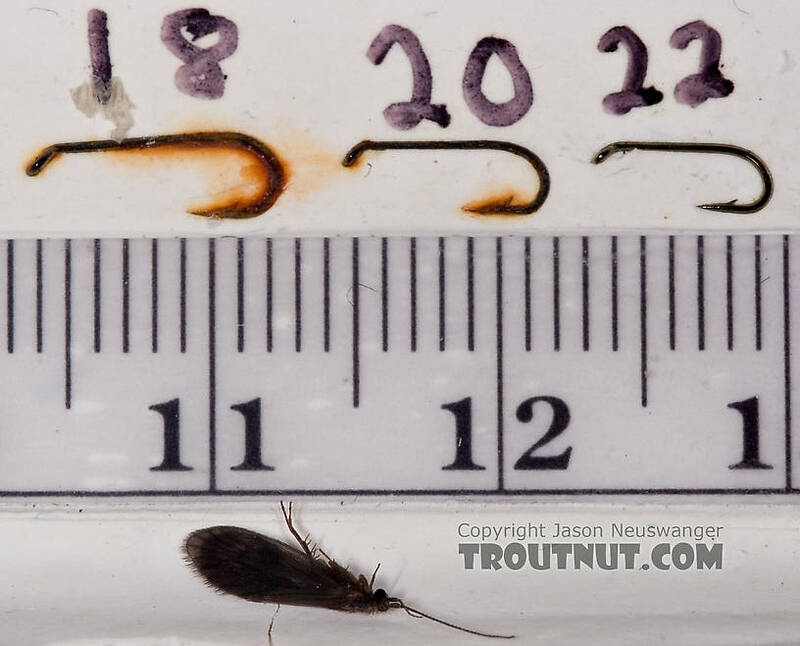 This little brown sedge was collected from Mystery Creek #42 on May 28th, 2007 and added to Troutnut.com on June 4th, 2007. I am very sure that I see this one hatching in late June. When we are up at the Beaver river our special place for the first week in July. That area is all the way up to Georgian bay. It certainly looks like this and the size it good. So assuming this is the right one what is this ones emergent time frame. It is a very fish able hatch for me at that time frame. If it is not this one would anybody know what its look alike is. I tie a size 20 for these little guy's. That would be Chimarra, most likely C. aterrima, but it could also be either C. obscura or C. socia. Based on that neat black egg mass visible in the ventral view photo, it would also appear that it's a female.